The Maloti Drakensberg Transboundary World Heritage Site is a mixed site known for its density of rock-art and mountain landscape. It consists of 2 parts: Ukhahlamba / Drakensberg Park in South Africa and Sehlabathebe National Park in Lesotho. The Drakensberg Mountains are the highest mountain range in Southern Africa. Its natural beauty derives of the rolling high altitude grasslands and the pristine steep sided river valleys and rocky gorges. The mountains are capped by a layer of basalt approximately 1,400 meters thick, with sandstone lower down, resulting in a combination of steep-sided blocks and pinnacles. It is an important habitat for plants (Drakensberg Alpine Region of South Africa) and a globally important endemic bird area. Sehlabathebe National Park is Lesotho's first national park. The landscape is dominated by grassland of various types. The larger ecosystem as a whole performs invaluable functions including providing freshwater to Lesotho, South Africa and Namibia. The Maloti Drakensberg Transboundary World Heritage Site covers hundreds of km’s of a mountain range on the border between South Africa and Lesotho, with protected areas on both sides. The whole region is known for its beautiful mountain landscape and abundant rock art. It’s especially popular with South Africans (pensioners mostly) for weekend getaways. Traditionally, the South African Drakensberg mountains are divided into 3 parts: southern, central and northern. I started my visit from the south, with the quaint English-style town of Himeville as my base. From the neighbouring town of Underberg daily 4x4 tours leave to travel the Sani Pass. This is a steep gravel mountain road that ends in Lesotho at an altitude of 2876 m. This may be one of the last years to experience this soft adventure, as the South Africans are planning to pave the road up to the top (the Lesotho side is already paved). This would deprive the tourist operators in Underberg from their steady income. But it may have a positive side also, opening up more creative tours besides just driving up and down. Touristy as it might be, I still enjoyed the trip up the Sani Pass. It has the great vistas that the Drakensberg mountains are known for, with rolling green(ish) hills and a heavy-looking basaltic top layer. It will give you a ‘country tick’ as well as it ends up in Lesotho – but we did not see more of it than the border post and the inside of a ‘traditional’ hut. On the way back we did encounter several Basotho herdsmen and their longhaired sheep on their weekly trip to the market in neighbouring South Africa. European tour groups and individual tourists generally only spend 1 full day in these mountains, but I had planned for 3. On my second day I focused on the Rock Art. The Central Drakensberg area has the best locations for that. I drove northwards on the N3, and took the turn-off to Giant’s Castle near Mooirivier. Not far from the turn-off you can also follow a road to Kamberg, home to the Game Pass Shelter (possibly the best example of San Rock Art). I was a bit pressed for time and worried about the road conditions though, and choose the safe option of Giant’s Castle. This still is a 56km drive, mostly paved but not all. Giant’s Castle now is a resort/lodge, where you can turn up as a day visitor and visit the Main Caves. Guided tours are available here every hour, a ticket has to be bought beforehand at the reception of the lodge. You’re then supposed to walk to the caves by yourself (some 35 minutes). I enjoyed this little hike, it goes through a very pretty canyon with a river. Many more trails are available for people staying overnight at the lodge. Near the caves you have to wait at a fence until the tour starts right on the hour. Only one other visitor showed up beside me, and we were taken along the 2 main caves by a guide. The rock art is painted in different colours here (yellow, red, white, black) and shows many elands. Depicted also are people hunting and dancing, and shamans watching. It includes an example of Contact Rock Art, in the form of two British military men with a gun. The British fought fierce battles here with the San people, eventually leading to the expulsion of the latter. During my final 2 nights in the Drakensbergen I stayed at the Greenfire Drakensberg Lodge, just outside the Royal Natal National Park – in the far north of the WH area. This is a lovely area to relax and do some leisurely hikes. I saw more primitive rock art here, and enjoyed the encounters with fierce-looking elands. My last of a fabulous few days in the foothills of the Drakensberg. Why fabulous? I was lucky. I picked the right guest house. The owners (aside from being lovely, warm people) are infinitely knowledgeable about THEIR Drakensberg. And passionate about Bushman rock art. I had been thinking “primitive daubs”. Now I know better. The Drakensberg has the world’s richest treasure trove of stoneage rock art. With artistic skills honed by a tradition of total intimacy with their environment, the Bushmen expressed their life experiences in art painted in the caves and overhangs in the mountains. They are drawings of infinite detail, sensitivity, movement and meaning. I mourn the cruel destruction of a civilisation that had much to teach us about “sustainability”. Only a few artifacts and 35 000 paintings, slowly weathering away, remain to tell the story of the Bushman. The top three Drakensberg destinations to see Bushman rock painting are: Game Pass Shelter in the Kamberg, Main Cave at Giant’s Castle and Battle Cave at Injasuti. KZN Wildlife operates guided tours from all three of these locations daily. There are literally thousands of other places in the Drakensberg where you can view Bushman paintings. But if you’re looking for destinations other than the “big three" mentioned above, then you’re going to have to get your hiking boots on. Recent legislation in South Africa has recognized this amazing outdoor art gallery, and that each painting is an irreplaceable treasure. As such they are protected. Please don’t touch. Or I’ll kill you. This Drakensberg story is one of retreat, beauty, relaxation and good eating.. The drive towards the Drakensberg Mountains swept over the undulating foothills down side-roads that snake along meandering countryside to our first destination Cleopatra Mountain Farmhouse. Cleopatra is tucked away in the beautiful Kamberg valley in the Drakensberg Mountains, it is a gourmet getaway where attention to detail is evident everywhere. The dining room and lounge are extended over a trout-filled dam that looks out across the water to the stunning mountains of the Southern Berg. It is a magical place - a secluded luxury hideaway where the most important factor is not to come here if you are on a diet! The build up to dinner was an event in itself with all the guests meeting at 7pm for drinks and given an entertaining, detailed account of the gourmet meal that was to follow by Richard the chef and owner. Everything is hand prepared on the premises, some of the sauces (the highlight of most plates) take up to three days in creation. It's three fabulous starters each, in our case a plate of meltingly succulent scallops, then a rich, baked butternut soup with a dollop of creamy pesto and a plate of Mozambican king prawns. A small freshening sorbet provided Richard the time for final preparations of the main course, an elaborate plate of choice lamb cuts on rosti with three different chutneys, and rounded off with a rich chocolate concoction, perfectly offset by homemade orange-infused vanilla ice cream. Breakfast the next morning followed in a similar style and although difficult to leave we knew that we had to walk some of this food off or we would never make the next meal. That food was possibly the best I have ever eaten but seriously doubt having survived 2 days of this non stop eating. Kamberg hosts a site of Bushman rock art with relative easy access, a stunning walk including a waterfall, and particularly well preserved examples of Bushman paintings. It is here that the "Rosetta Stone" of San art first provided archaeologists with the key to interpreting the symbolism of the paintings as spiritual in content - showing how hunters gained power from the animals that they killed. Its all professionally explained by guides and although I had seen these paintings before I was again moved. The road to our next stop the Antbear turned out to be just a little hop away mainly because Richard had guided us via the back roads. The Antbear Guest House is one of those seldom found gems hidden away in a network of rural roads in the Drakensberg foothills. The little white washed farmhouse has been converted into a place of artistic elegance. It is full of hand sculptured wooden furniture, a labor of Conny and Andrews love. Andrew greeted us dressed in very flamboyantly African dress and welcomed us with a cup of tea. He is a humorous character with a passion for entertaining, conversation and alternative living. Andrew is a dab hand in the kitchen too. The food is very different to that of Cleopatra definitely not as rich but no less of an experience. Supper was the best Indian food I have ever eaten with a selection of curries, papdams, onion badjis, sambals and naan bread to boot. Andrew quite likes the company in the kitchen and its really different watching this kind of cooking. Its like a circus as he casually juggles the egg turner or adds a handfull of spice to some frying onions. The hosts eat with the guests at a single table with candle chandeliers and a fireplace. Its very welcoming indeed. For desert Andrew whipped up caramelized cape gooseberries in whiskey with hint of time. Why the Antbear is so affordable is a bit of a mystery me and till today the Antbear is my favourite guesthouse anywhere. Armed with Conny’s picnic lunch setoff to Giants Castle Nature Reserve. 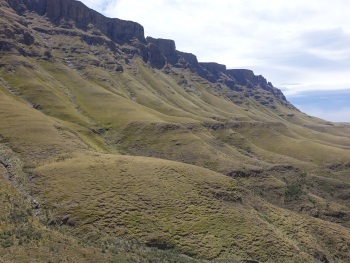 Giants Castle is a spectacular part of the Drakensberg and one of my favorite regions. Its has less tourism than most other parts and I have always wondered why as it is about as beautiful as it comes. We wanted an easy walk so opted for Worlds View a 14 km trail with a spectacular 360° view at its end. We had lunch and soaked in the views and got back to Giants Castle Camp in time for a well-earned cappuccino and piece of cheesecake. Dinner back at the Antbear turned out to be a Moroccan evening. Again the food was excellent. Andrews advice and enthusiasm inspires confidence and we reorganised some of our plans The following day was supposed to be a visit to the battlefields but I had forgotten about the Drakensberg Boys Choir. Andrew arranged tickets for us and this is really something not to be missed under any circumstances. The day was spent in the Champagne Valley another beautiful part of the Drakensberg. For dinner Andrew had taken the Zulu line. An interesting stew with a type of dumpling bread baked in the same pot. Butternut and maize meal and some wild spinach added a touch of colour. What I have never seen before was the wild asparagus sautéed in lemon and butter with a hint of sesame oil. I start to drool even thinking about that now. Montusi a bit like a hotel with a personal country cottage feeling about it. The lodge is perfectly positioned to catch the surrounding view, fields of galloping horses and lakes to fish in. The food here too is excellent perhaps not as unexpectly different as the Antbear but our lamb with chargrilled lemon and mint was perfect. Our last day in these mountains was spent walking the Tugela Gorge Walk below the Amphitheatre in the Royal Natal National Park. It took us to the base of the Tugela Falls, where the Tugela River plunges 948m (3,109 ft.) from the plateau, its combined drop making it the second highest falls in the world, and afforded us marvelous views of the Amphitheatre. Our trip back to Durban guided us through the Midlands Meander a place I find to be over rated unless you make the effort to pick out the gems that it does offer. We stopped at Marakesh Israeli Goats Cheese for a glass of wine and some cheese tasting. A perfect light snack after that lovely drive to get here. Our next stop took us passed the Karkloof Falls to the Karkloof Canopy tour.a unique eco-experience that takes people on a 3-hr adventure through the magnificent Karkloof indigenous forest. The canopy tour involves traversing from one platform to another along a steel cable suspended up to 30m above the forest floor. It was five thirty when we arrived back at my flat in Durban. We were all tired but satisfied with our week in the Drakensberg Mountains. I know that this region offers much more and far greater extremes but for us it was a perfect balance of natural beauty, good living and just a little excitement. I visited Ukhahlamba/Drakensberg Park a year ago with a Canadian friend. We stayed at Giant's Castle, a rest camp management by KwaZulu-Natal Wildlife. The mountains towered above us in a grand and barren way, with thickly overgrown gorges marking the folds in the mountains like creases in an old overcoat. The blue of the sky was unmatched by anything I've ever experienced and the brightness of the Milkyway on a moonless night equally so. Our time there was limited, so we took only one hike - to see the rock art in some caves about 30 mins away from the camp. En route we saw an eland bull - just across a deep gorge. He was fully aware of us, and completely relaxed - he knew the value of a gorge between himself and two humans. We arrived too late to participate in the tour of the caves, but it didn't matter: the hike and the scenery and the eland were well worth it. The accommodation was good - all chalets have an unobstructed view, and each vista is special in its own way. We had a very effective fireplace (necessary at night in the mountains in May), and great duvets on the beds. We slept with the curtains wide open, so that not a single sight of the great mountains would be lost. There was a small problem with a scavenging baboon who threatened us - a typical problem when camp management is slack about clearing out garbage. Would I go back? Yes and yes again!! From "Ukhahlamba / Drakensberg Park" to "Maloti Drakensberg Transboundary World Heritage Site"
Territorial Highest points: Mafadi (Nthleledi) 3451m/11322ft (also stated at 3446 and 3450m). NB: some sources cite nearby Thabana Ntlenyana (3482m) as being the highest peak in S Africa but it is just across the border in Lesotho. As is Makheka (3461m). Built in the 2nd Millennium BC: "Radiocarbon dating of pigments and charcoal from occupation layers indicate that the earliest paintings date to c 3800 BP."